In the news today, the UN International Civil Aviation Organization reported “significant safety concerns” with Thailand’s air safety practices last week. The negative report may prevent some flights from coming out of the kingdom and forced Thailand’s government to deal quickly with the results on Monday. Every year on April 1, April Fools’ Day is celebrated in many countries around the world. Simple pranks, like telling a friend a funny lie or making prank phone calls, are still common. But, major companies also get in on April Fools’ Day fun in a much bigger way. A few years ago, on April 1, Starbucks announced it was introducing new coffee cup sizes - Plenta and Micra. The very large cups, bigger than a human head, remained useful for customers even after finishing all that coffee. 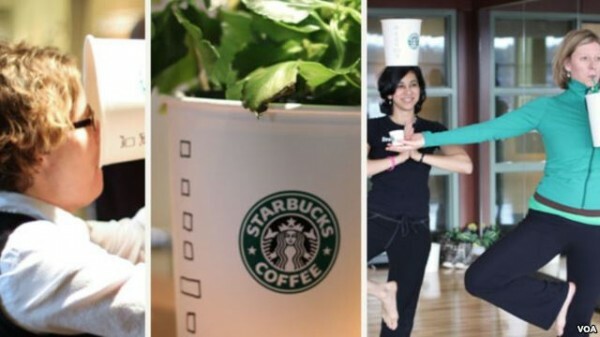 According to Starbucks, the cups could be used as a rain hat, a pot for plants, or a lampshade. And sometimes, simple, more traditional April Fools’ pranks go viral on social media. Last year, a class of college students in the U.S. state of Michigan played a prank on their professor. The professor had a classroom rule that, if a student’s phone rings during class, the student must answer it using the speakerphone. This means the whole class gets to listen to the conversation. One student decided to teach the professor that his rule could be dangerous. She planned for a friend to call her, pretending to be someone from the Pregnancy Resource Center. On speakerphone for the whole class to hear, the friend announced the news that the student’s recent pregnancy test was positive. The professor quickly got embarrassed and told the student she should turn off speakerphone. Do you have any ideas for April Fools’ Day pranks? Have your friends played pranks on you before? Tell us about one in the comments section! viral – adjective (имя прилагательное) relating to or involving an image, video, piece of information, etc., that is spread rapidly and widely from one Internet user to another.